If you love the outdoors, you’ll love the Mendip Hills. There’s so much to do - walking, riding, cycling, climbing, caving, fishing and many other activities. We’re continuously adding to our Walks & Events Programme so keep an eye on the list for dates that suit you. The Mendip Hills are the most southerly Carboniferous Limestone upland in Britain. Carboniferous Limestones were laid down during the early Carboniferous period, about 320–350 million years ago. As a result of Variscan mountain-building, the Mendip area now comprises of at least four anticlinal fold structures, with an east-west trend. Mendip was considerably higher and steeper 200 to 300 million years ago. Weathering has resulted in a range of surface features including gorges, dry valleys, screes and swallets. These are complemented underground by a large number of caves, including Wookey Hole, both beneath the plateau and at the base of the southern escarpment. There are also limestone pavements and other karst features. Dissolution of the limestone produced many of the gorges including, most famously, Cheddar Gorge and Burrington Combe. Springs, a number of which deposit tufa, are a particular feature of the eastern part of the hills. The Mendip Hills have a rich archaeological heritage, ranging from Mesolithic cave deposits to Second World War military features. The landscape was exploited throughout the prehistoric with a wide range of site types including settlements and ritual landscapes. The landscape appears to have had significance in the Neolithic, with such field monuments as mortuary enclosures and the henge-like Priddy Circles constructed during this period. There are approximately 300 barrows across the Mendip plateau, constructed between the Neolithic and the early Bronze Age, highlighting the ritual significance of this landscape. Bronze Age barrows are frequently found in linear cemeteries, such as Ashen Hill barrows and Priddy Nine Barrows. Late Bronze Age/Iron Age settlement sites such as Pitcher’s Enclosure, near West Harptree, or Dolebury hill fort, near Shipham, have been found around the edges of the higher ground. There is a concentration of possibly ritual field monuments in the centre of the plateau, but some monument types, such as Bronze Age barrows, occur in most areas. 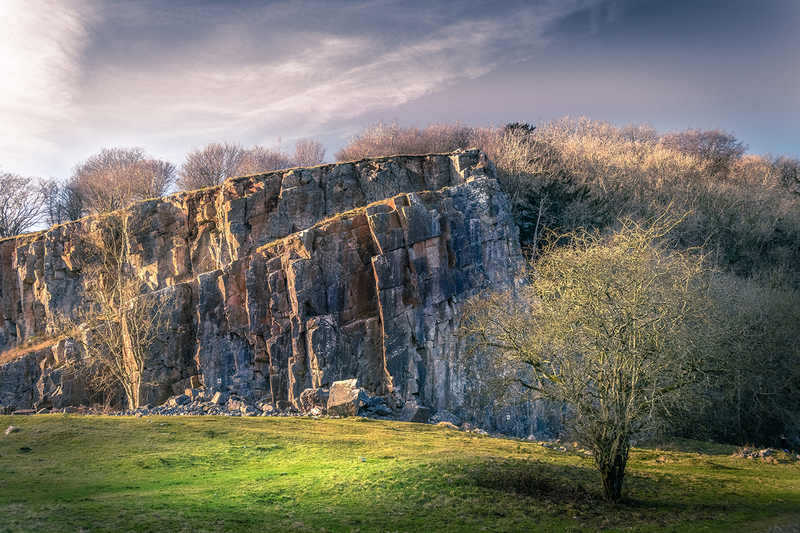 The Mendip Hills are the most sounthern outcrop of Carboniferous Limestone in England rising to a height of a little over 300m above OD and forming a dramatic contrast with the low lying Somerset levels. The limestone geology gives rise to a characteristic “karst” landscape of crags and gorges. There are no rivers on the main plateau of the Mendips, but ground water permeating through the rock forms a number of springs at the base of the scarp and these feed into the rivers Yeo, the Lox Yeo, The Cheddar Yeo and the Chew. The outpouring of water from these springs has been a key factor in the development of settlement at the foot of the scarps. These habitats are spread throughout the area but the woodlands and calcareous grasslands are largely confined to the steeper slopes. In addition, there are areas of both acid and limestone heath, the former being largely confined to the Devonian sandstone outcrops. Mendip also has a number of individual species of plant and animal which by virtue of their restricted distribution in England deserve special mention. Many of the dry stone walls on Mendip were built just after the enclosure act, although some date back to Medieval and Roman times. They are very important as a wildlife habitat. They are home and a food source for many species and are also hosts to ferns, mosses and lichens. Not only do they make good boundaries, they have the advantage of being excellent shelter belts for stock and crops and also help prevent soil erosion.